What is, and who needs, master key system? A master key system allows one key, which is given to authorized personnel, to open more than one lock to have access to different doors within the master key system. Master key systems allow one key to open up to as many locks as you need. Landlords, cleaning crews, hotel housekeeping staffs, schools, college campuses, and offices all benefit from using a master key system since it eliminates the need to have a huge key chain filled with keys and also allows for implementing specific security measures within the master key system. Master key systems offer convenience, security, and affordability. The convenience allows specific keys to open doors in specified areas. Master key systems provide an added level of security to spaces that are heavily populated because it keeps staff, students, or other visitors or employees out of places where they are not authorized to be. These systems are less expensive than you may thing. They are inexpensive to install and easy and affordable to upgrade. So, exactly what is, and who needs, master key system? Most master key systems use a pin tumbler lock. Pin tumbler locks open when the driver pin and key pin in the pin stack are elevated above the shear line after the key is inserted and turned. The key pins are all of varying sizes, but the driver pin is of a universal size. The key that is inserted into the lock has to have the right set of grooves to lift the key pins to the needed height. When a pin tumbler locking system is converted to a master key system, a master wafer pin is added that goes between the driver and key pin. Once this wafer pin is inserted the pin stack has two shear lines. One shear line is for the pin stack and one is above or below the line that allows the master key to work. Change Key – The change key is also sometimes referred to as the sub-master key. It is the lowest level on a master key system. Its purpose is that it opens only one lock or one type of lock. 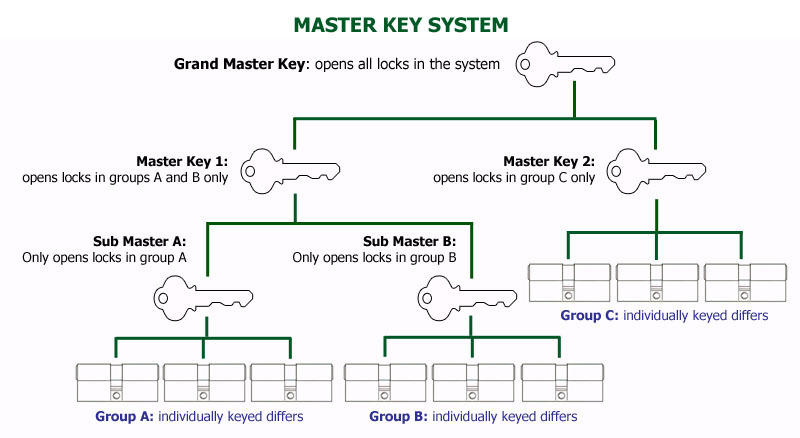 Master Key – The top level key in a master key system that is able to open every lock under it. Grand Master Key (These can grow and branch of up to Great Grand Master Keys and additional layers as needed) – In more complicated systems, these are the highest level keys that will open every lock beneath it. The benefits of having one master key that opens several locks allows you convenience so as not to have to juggle several keys, and it also allows you to control who has access to specific areas. 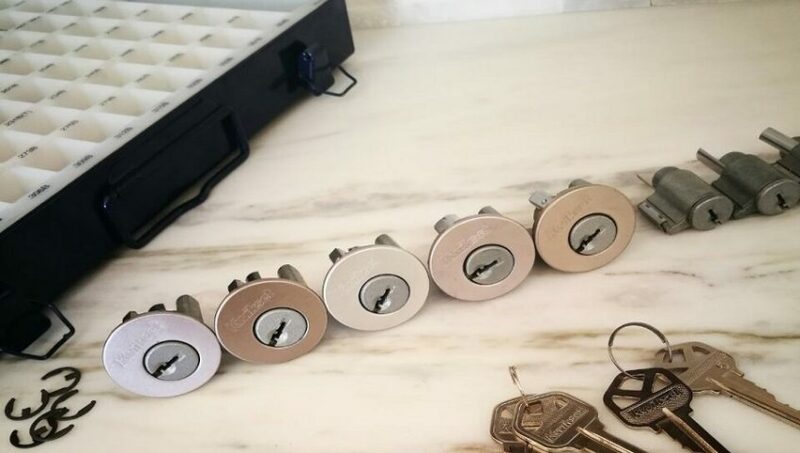 One possible downside is that the pin and tumbler locks typically used within a master key system are easier to pick than other high-security lock options. There are ways to increase your security within the system, and if you use a master key withing a building, it is a good idea to install a heavy duty secure lock on the outside of the property. To make your master key system more secure, talk to a professional about adding elements of added security. Some secure extras include using electronic controls, installing sidebars, implementing master rings or restricted keys, employing multiple cylinders, disk detainer locks, or using separate master key systems for different work groups or locks on separate parts of the building. When you are wondering what is, and who needs, master key system, contact a local commercial locksmith who will be able to recommend the best system for your needs. Have a master key system installed, customized to your specific needs, and maintained with the help of a knowledgeable and skilled professional locksmith.